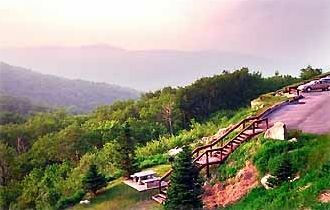 GORGEOUS VIEW - TOP OF MOUNTAIN - 5140 FEET - SAVE $$/DISCOUNTED RATES! Renting from the Owner / not Real Estate Agency - EXCLUSIVE - GATED RESORT! Large (1100 square foot) condominium high atop Sugar Mountain. Here you look out over several states at an elevation of more than 5000 feet. The beautiful scenery is viewable from each room or on your own private balcony. Condo is nestled in an alpine-like village, Banner Elk. High speed internet, free wifi, smart TV's. At night, view the lights of village below - heavenly sunsets, very romantic - peaceful, serene setting. The building also has large, outdoor deck. Convenient 24 hour front desk and 24 hour security. There are many activities in the area. From the first floor, step into the All Seasons Recreational Center with its indoor heated pool, sauna, steam room, jacuzzi, and exercise room. Enjoy all of this while feasting on the mountain scenery through windowed walls. THIS AREA WAS FEATURED IN NATIONAL 'FAMILY FUN' MAGAZINE!